A Jose Canseco personal appearance, Jose Canseco speaking engagement, or Jose Canseco endorsement will reflect well on your company. To hire Jose Canseco now for any corporate appearance, fundraiser, motivational speaker event, personal appearance, autograph signing, or website endorsement please contact our celebrity agents at 1-877-6-SPORTS. We will contact Jose Canseco or contact Jose Canseco's agent and provide you with the booking fees and availability immediately upon your request. Direct Sportslink is the only sports speakers bureau and talent booking agency based in the United States securing only sports talent for corporations, associations, and organizations for motivational speaking engagements, personal appearances, and endorsements. We are the premier sports celebrity booking agency and a sports celebrity procurement expert. Accordingly, we will provide you with any relevant Jose Canseco website information and booking agent details so that you can hire Jose Canseco for your next event. 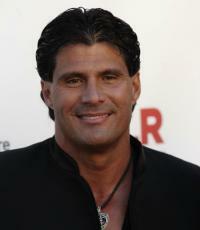 The Oakland Athletics drafted Canseco in the 15th round of the 1982 Major League Baseball Draft. He played minor league baseball with the Madison Muskies, Idaho Falls A's, and the Modesto A's. Canseco started the 1985 season with the Class-AA Huntsville Stars and became known as "Parkway Jose", for his long home runs (25 in half a season), that went close to the Memorial Parkway behind Joe Davis Stadium. In 1985, Canseco won the Baseball America Minor League Player of the Year Award, and was a late season call-up for the Oakland Athletics, playing in 29 games in the major leagues in 1985. He established himself in 1986, his first full season, being named the American League's Rookie of the Year, with 33 home runs and 117 runs batted in. In 1988, Canseco became the first player in major league history to hit at least 40 home runs and steal at least 40 bases in the same year, by hitting 42 home runs and stealing 40 bases. That same year, he helped the Athletics to the World Series but they lost to the Los Angeles Dodgers in five games. Canseco was unanimously named the American League's Most Valuable Player in 1988, with a .307 batting average, 120 runs scored, 124 RBI, 42 home runs, and 40 stolen bases. In 1989, Canseco missed all but 65 of the regular season games with a broken wrist, but he still managed to hit 17 home runs as the Athletics won their first World Series since 1974, beating the San Francisco Giants in four games. On August 31, 1992, in the middle of a game and while he was in the on-deck circle, the A's traded Canseco to the Texas Rangers. In the 1994 strike shortened season, Canseco again returned to his former status of power hitter with 31 home runs and 90 RBI in 111 games. Canseco also stole 15 bases and posted a .282 batting average. He was named comeback player of the year in 1994, and finished in eleventh place in the American League Most Valuable Player voting. After playing with the Rangers from 1992 to 1994, Canseco moved on to play with the Boston Red Sox from 1995 to 1996, the A's in 1997, and the Toronto Blue Jays in 1998 where he won the AL Silver Slugger award. Canseco went to the Tampa Bay Devil Rays in 1999, the New York Yankees in August 2000 where he made one appearance in the 2000 World Series against the New York Mets and earned his second World Series ring when they defeated the Mets in five games. Canseco played with the Chicago White Sox in 2001, the Expos in 2002, but later retired in May 2002. In 2011, he was a contestant on Celebrity Apprentice. Based on your interest in Jose Canseco as a speaker or for a personal appearance, Direct Sportslink has provided you additional links below for other sports talent with similar appearance fees, speaker topics, and categories that match Jose Canseco.